This multi-function bench allows you to create a mechanics standard. You can create 2 setups: free fall and inclined plane. The air cushion bench is a scientific device used to study motion in a low friction environment. This complete forced oscillations and resonance pack is designed to study, statically and dynamically, the simple spring pendulum. 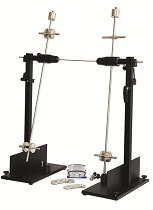 This comprehensive mechanical pack is designed to study a pendulum weight, a spring pendulum or pendulum pairs. A loudspeaker coupled to a function generator generates waves of varying frequencies. A micro equipped with an amplifier observes waveform at various points of the tube, thus identifying by measurement the maximum (probe on an antinode) and minimum (probe on a node) pressure values of the standing wave. The observed signal is visible on the oscilloscope. microphones will be used to receive and analyse these waves. A set of accessories will be available to study the laws of optics (transmission, reflection, diffraction, etc.). The ripple tank is an ideal demonstration tool. Using this new system digitised by Webcam, the ripple tank can now be used with interactive charts and video projectors. This device is used to measure the surface tension coefficient using the ring method (also known as the du Nouÿ ring method) for fluids with small and average surfactant concentrations (water, hot water, oil, alcohol, etc. ).